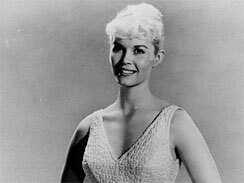 Dorothy Provine, the leggy, blond actress perhaps best known for her quirky role in the Stanley Kramer movie �It�s a Mad, Mad, Mad, Mad World� and as the flouncy nightclub singer on the 1960s television series �The Roaring �20s,� died on Sunday in Bremerton, Wash. She was 75 and lived on Bainbridge Island, Wash. The cause was emphysema, her husband, Robert Day, said. Ms. Provine appeared in more than 40 film and television productions, starting in 1958 in the title role in the movie �The Bonnie Parker Story.� Five years later, Mr. Kramer cast her as Emmeline Marcus Finch, the only character in �Mad, Mad World� not obsessed with finding $350,000 in buried treasure. Among the marquee names with whom she starred were Spencer Tracy, Milton Berle, Ethel Merman, Buddy Hackett and Edie Adams. In 1960 and �61, Ms. Provine played Pinky Pinkham, the Charleston-dancing flapper in the ABC-TV series �The Roaring �20s,� a drama about racketeers and reporters who often ended up at the speakeasy where Pinky performed. �It is Dorothy�s oooohing and shimmying that have kept the series afloat,� Time magazine said in May 1961. Shimmying came to her early on. Dorothy Michelle Provine was born on Jan. 20, 1935, in Deadwood, S.D., one of three daughters of Virgil and Kathleen Provine. �As a child she dressed up in pillowcase sheaths with her little sister and learned the Charleston,� Time magazine said. Besides her husband, Robert, a movie director whom she married in 1968, Ms. Provine is survived by her sisters, Patricia Coldiron and Susan Cameron; and her son, Robert. Among her other credits, Ms. Provine acted in �Good Neighbor Sam� (1964), �That Darn Cat!� (1965), �The Great Race� (1965) and �Kiss the Girls and Make Them Die� (1966).